When the weather warms up, it’s time to put all of those beautiful, cozy sweaters and boots away, and pull out all the frills, floral patterns, and lengths of summer dresses! Since our temperatures reached into the 90’s already, I have been wearing dresses quite a bit, especially on the weekends. 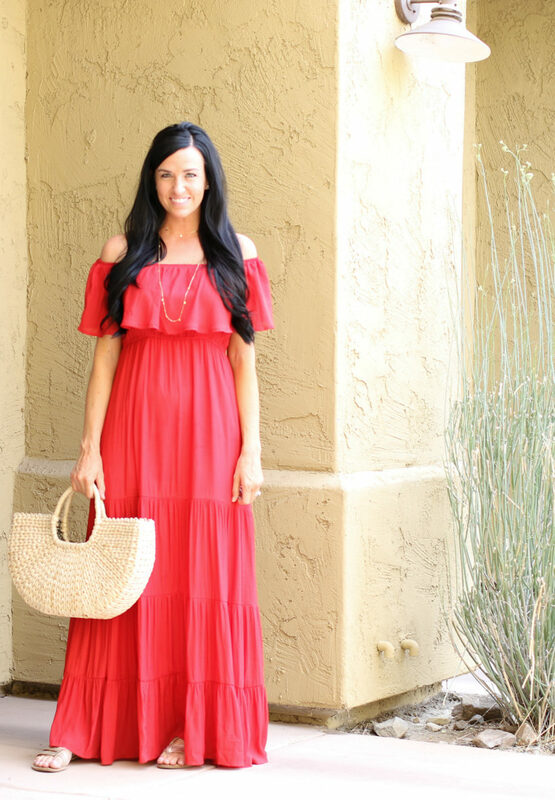 One of my favorite styles to wear when we go for a casual dinner is the maxi dress! It’s nice to just throw on some cute, flat sandals and add a summer bag and head out the door feeling put together. This red off-the-shoulder maxi was no exception! It came in the mail last week, and I immediately fell in love with the color and style combination and wore it out for dinner that night. It runs true to size, and I paired it with gold accessories and a favorite straw tote bag. Get summer-ready with even more cute maxi dresses! I linked up a bunch below – click through the carousel to browse or shop! What kind of dresses are your favorite for summertime?